Now that my daughter is turning three, she’s starting to run around and explore new activities. I’m constantly finding myself under pressure to come up with new low-cost and healthy ways to let my little girl have fun. Being a nature lover, camping seemed like an obvious choice. But I was a nervous at first. I knew tent camping with a toddler would be a challenge. After what seemed like weeks of putting together checklists, and researching the perfect campsite I couldn’t be more happy with the result. Our family had an amazing time camping in the Adirondacks. And I know this won’t be the last family camping vacation we take. During the trip there were quite a few tips and tricks I picked up to help things run smoothly. I’m hoping I can share my experience to ease your nerves and allow you to share one of the best vacations we’ve ever had with our family. Bring Snacks … And Lots Of Them! One thing I have learned about having a toddler is that they are at that awkward stage, where they are constantly learning and are very curious. Their minds are busy making connections all the time … and their hands can be just as busy! Allow them to snack away when you need a short break or if you need them to calm down for a second. This is also a great tip for hampering tantrums. Camping trips often require a long drive outside of the city and children may be cranky at during the drive. Eating something should be enough to stave of hunger and keep them in a good mood enough to give you some peace. Although I have only one child, I also have nieces that are able to keep my daughter entertained when I need a break. The more kids that come along, the easier of a time you will have because they will usually entertain each other. Camping is also a good way for them to share a big experience together and strengthen their bond with each other. I found including my sister and brother-in-law on the trip really helped enlighten the experience. We were able to get some much needed family time without the distractions of a phone or TV. There’s nothing better than the look my three year old gets when she sees something new and she is unsure of it. She looks up at me with the most curious expression on her face! She is looking for reassurance. And I get the best feeling when I’m able to explain to her what a lightning bug is, why the leaves change color, or whatever else crosses our path. A camping trip is a learning experience you can’t get in the classroom. You child looks to you to show them the world. A tent camping trip with a toddler is so unique and something only a few kids get the joy of experiencing at such a young age. Toddlers have busy hands. And they love to be a good helper. I like to use that enthusiasm to let her help me unpack the car or pitch the tent. This will also allow you to keep tabs on their whereabouts while you set up the campsite. Some toddlers have a habit of scampering off, but this will hopefully help you avoid this problem and give them the sense of independence they so love at the same time. A small child may not know what to expect with a camping trip. They’re used to sleeping indoors. And as we all can imagine, sleeping outdoors is quite a different experience. You can help them by building the anticipation in a positive way. Watch camping movies. Read camping books. Let them know how fun it will be. I asked her if she was excited to go camping often and by the time the trip came, she couldn’t wait to go! Remember: This is the age of imagination, and the more exciting you make it, the more memorable it will be for them. It’s hard to know what to pack when bringing along a toddler. Especially if it’s your first time. Keep comfort in mind. Be sure to spring for a tent with more than enough space to securely fit everyone. Pack thick blankets and lots of extra layers for the kids to sleep comfortably. Give them little lights or glow sticks so they can see at night (and you can keep them close by). Make it fun by coming up with some cool dinner ideas! S’mores is a must. But there are also tons of creative camping recipes that you can cook over a campfire or make at home and bring along. Adults may enjoy sitting back and watching the fire, but that’s not going to cut it for the kids! There is an absolute need for games, toys and constant entertainment. A few ways to keep them occupied is to swim with them, let them burn off energy by running around, and taking them out on the trail to sight-see. The idea here is to keep them moving and keep their minds engaged. The best part about this is that when bedtime comes, you all will be able to get a good night’s rest. The quiet of nature should help promote a sound sleep, as well. One mistake I made was, in light of the summer weather, I did not think to sift through my daughter’s winter wardrobe to find a couple tights and long-sleeved shirts. This is a must. Clothing that covers their little arms and legs protect them from mosquito and other insect bites. In addition, a first aid kit is a must! Include calamine lotion, A&D ointment, Cortizone 10, alcohol, and bandages. With so much movement, you will be bound to need one or more of them. Lastly, you will almost always need wipes; try for a pack of wipes for every 3 days per child. Also, diapers, if you need them. I would pack one for every 2 hours of your trip, to make sure you have sufficient supply. Many popular campsites have cell phone reception so that emergency calls can be made. However, I call well ahead of our trip to make sure I am not caught off guard from any emergency plans. If the campsite does not have (good) cell reception, then a first aid kit is even more important for your trip. Babies and children are highly adaptable and a good rule of thumb is that if you don’t feel a threat, they won’t. For my family camping trip, my husband and I agreed not to discuss bears, snakes and anything else that could scare one of the kids. But we still kept these things in mind- especially when choosing a camping spot. Keep proper ratio of kids to adults. Never over-estimate how many children you can handle on your own. A good rule of thumb is to reduce that number by 1 or 2 and then have a fellow adult tag along and split the kids into groups that each will be responsible for. This especially applies when there is a large body of water around. 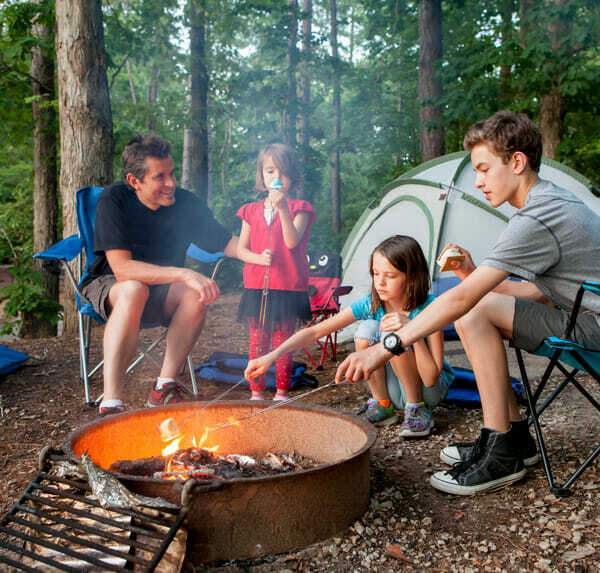 Family camping trips can be an awesome bonding experience for the entire family. I hope you are able to learn from some of my mistakes and make your upcoming camping trip one to remember! Being out in nature helps to relieve anxiety and could help to solidify the bond within your family. I know that this was the case for my family. The main key is to make this trip as stress free as possible. There are also other small tips that should be included, but it would make this list too long. Just to name a few: Make sure your child has a comfortable car seat, for long trips to the campsite, bring enough blankets to layer onto the floor so that their bed is comfy. Lastly, do not forget a lantern! The latter was my big mistake. I am a city girl and had to pay a hefty price for a fancy souvenir lantern because I took electricity for granted, having forgotten that the “curtain falls” in the woods at night, as my family likes to say. It gets pitch black at night and you need a way to be able to see your surroundings. Now that souvenir is a reminder for me to do my research and make a checklist before going out camping again. It is so easy for most of us to forget the small things. I found my initial camping fears to be largely unwarranted when we got there and I am honestly glad we went. One last tip on your research is to check multiple lists. You will be surprised to know how many moms go back and remember the small things that they either forgot or wish they had on their camping trip like non-perishables, their child’s favorite toy, toddler formula or the like. Gathering up a poll of lists should help you more than anxious moms out there to feel more secure and prepared to make the big trip. If you forget anything, don’t stress! The morning will come soon enough and that part will be forgotten when you look back on this unique camping trip.